One of the oldest books in the world, the I Ching has been used in China for millennia to open a dialogue with divinity, gain insight and wisdom, and pull aside the curtain of reality to reveal the light of the heavens. Yet, despite its popularity over thousands of years, few understand its mysterious origins, symbolism, or occult connections. In this illustrated guide, Maja D’Aoust applies her significant experience as a professional practitioner and scholar of the I Ching to provide a history of the oracle, explain the mechanisms at work behind it, and offer a new experiential approach to its interpretation. 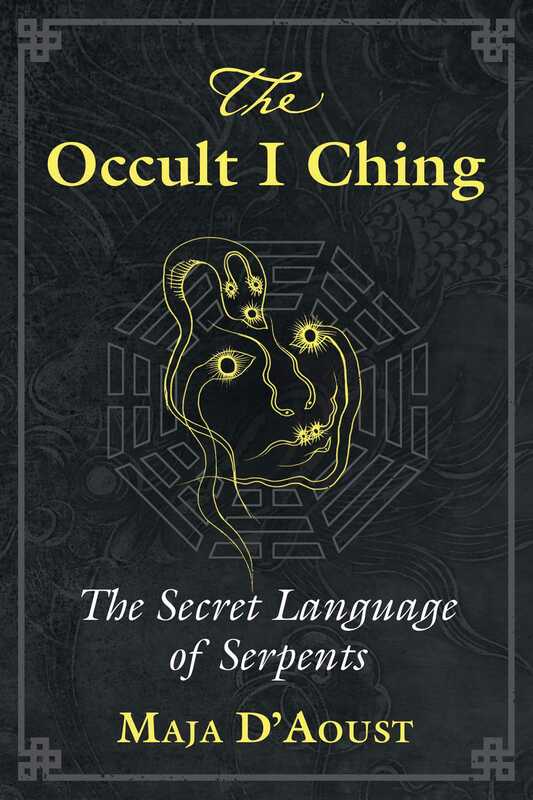 The author begins by examining the discovery of the I Ching by the first mythical emperor of China, Fu Xi, a divine being with the body of a serpent. She reveals how Fu Xi’s eight original trigrams, also called the Ba Gua, provided a sacred language of symbols that allowed for communication between the diviner and the spirit world. Using the I Ching’s principles of cosmology as a basis, the shamans of ancient China developed the earliest Taoist philosophies of nature, medicine, martial arts, and mathematics as well as ecstatic practices, war strategies, birth and death rituals, agricultural systems, and alchemical studies. D’Aoust further shows how the I Ching relates to the mathematical sequences of biology and human DNA, examining the correlation between the serpent’s tail and the double helix. She reveals how the ways the oracle connects with your own inner knowing parallel the ways in which DNA repairs itself. Providing a new analysis of each of the 64 hexagrams and their changing lines and archetypes, the author explores each hexagram’s meanings in depth, alongside original artwork highlighting the serpent magic within the system and tools to help you interpret the I Ching based on your own individual experience. Revealing how the oracle holds complex networks of meaning that language alone fails to capture, D’Aoust offers a new understanding of the Book of Changes and its many hidden lessons. Hexagram 1 is the mechanism of creation. Every line is yang and it is the supreme masculine or “Heavenly Father” archetype. It is creative force, which in the Hebrew Bible is described as the Ruach Elohim, or “breath of god.” The Breath of God creates life through interacting with the Earth below it in a penetrating fashion. A perfect example of this concept is the point when the Holy Spirit breathes life into Adam who is only a hunk of clay. It was this same breath in the form of the Holy Spirit that impregnates Mary with Jesus in the Judeo-Christian bible. The Dragon is the animating force that brings things to life, the breath that makes us live each moment and inspires us to continue with our respiration. In the I Ching, the concept of Heaven, or “Qian,” is translated as dynamic tension, which can be compared to a string pulled taught. This can be conceived of like a guitar string that when pulled tight yields a specific tone. The Dragon is the vibrating superstring that lies at the heart of all matter, swirling and singing in the heavenly chorus. Heaven is something that is stretched out, or far reaching in the Chinese version, and goes horizontally, not vertically. Hexagram 1 then is something that can stretch very far and not lose its tension. We can think of this like the practice of martial arts, which aimed at having flexibility in the body, also like the practice of yoga. Something taught yet supple, strong yet flexible, are the qualities of Heaven and the Divine Masculine force. I received this Hexagram, unchanging, when a client was asking the oracle about their cannabis use. I felt this fascinating, since the meaning is literally creative inspiration that enters through the breath. One need only research some of the many artists, musicians, and philosophers who employ the use of cannabis in their creative endeavors to see the creative influence it can exert. I also was struck by the Oracle script image for “Qian” which looks like the chemical compound of a cannabinoid joining its receptor in the human brain. The “lock and key” biological enzymes function looks very much like the image of the dragon reaching down from heaven to join with the earth. Keep yourself hidden, action out of season is like eating flowers before they turn to fruit. Reserve your creative power. Sometimes you don’t have to make a huge display. Just knowing you have it might be enough to turn the tide without action. Intention of what you know deep within can have more power than action when it is withheld and grown on the inside. To see a dragon is a great omen that you are on the right track. If you have a bright idea, do not fail to recognize it. Write it down, pay attention, don’t let it slip by into obscurity, try to harness it into something for all to see. Inspiration may come to us from an outside source, but until we create it into something within us it is just a passing fancy. Do the work, get your hands dirty. Turning an idea into a fruit that can be eaten takes a lot of labor. Just as a seed requires care in order to become an apple tree, so too does your creative idea require an amount of work in order to reach culminated manifestation in the world. A baby takes a lot of time and energy to grow within a womb and must be nurtured, do not be afraid to nurture your creations. Caught in the middle of making a decision is a good place to be if you are not sure which way to go. Wavering can create dynamic tension to ensure you arrive at the correct location. Deliberation does not have to turn into frustration if you can capture its energy. Through hesitation a reaction is decided instead of imposed through emotional response. The difference between conscious and unconscious action is decision that comes through deliberation. A beautiful dragon is meant for all to see, don’t be shy or worry what others might think of you or your ideas. The most difficult demon to conquer is the self-worth atrocity that afflicts even the most noble and virtuous hearts. An understanding that you have equal worth upon the Earth as other creators can make the difference between allowing yourself to express and shrinking into the shadows to skulk with insects. Be bold and fearless when showing what you are worth, you are as good as gold, after all. Sometimes heaven can be too high to reach. We must learn from Icarus that if we mount a high horse to heaven the fall can be great indeed. A great idea still does not raise you above the level of humanity. Mind your manners even in the face of your own greatness, which can be as great as a dragon but not likely greater than a dragon. Arrogance is a sure way to experience humiliation, one of the Earth’s greatest teachers, often met when doing a face plant into the dirt. Brush yourself off and get back up, but leave the chip on your shoulder in the mud. Maja D’Aoust, known as the Witch of the Dawn, is a practicing Witch and scholar of alchemy and occult lore. After completing her bachelor’s degree in biochemistry, she studied Oriental medicine and acupuncture and later earned her master’s degree in transformational psychology with a focus on shamanism, the I Ching, and ancestors. She is the author of A Witch’s Bestiary: Visions of Supernatural Creatures, co-author of The Secret Source, and creator of a Tarot deck, The White Witch Tarot. She lives in Los Angeles.